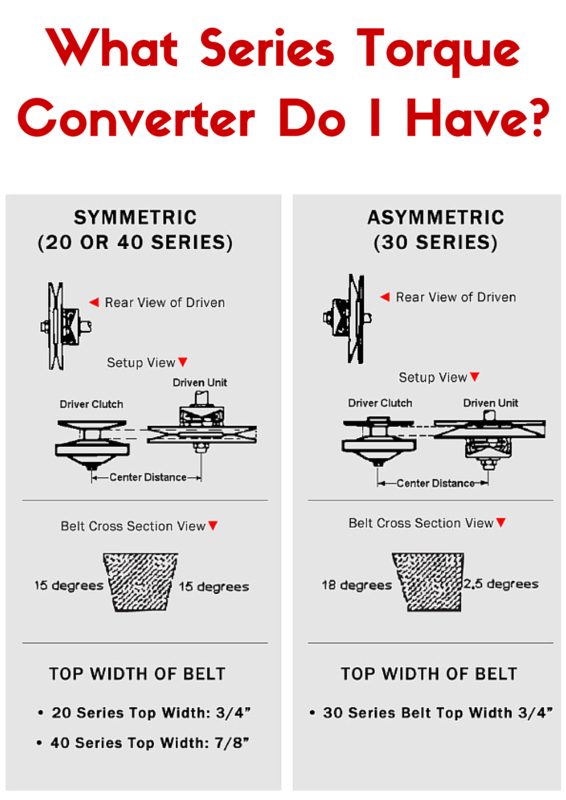 Home > Manuals > What Series Comet Torque Converter Do You Have? What Series Comet Torque Converter Do You Have? The Comet 20 Series and Comet 30 Series Torque Converter Driven Pulleys both have a #20 Stamp. This Stamp does not determine the series type, ignore it completely. It's the degree of the angle of the component. Asymmetric Systems have all the working parts on the same side. Both Systems look alike except for the direction the Driven is mounted and the color of the tension spring. Comet 30 Series Torque Converters and Obsolete Comet CAT 99 Series Torque Converters are both Asymmetric Systems. Comet 20 Series Torque Converters and Obsolete Comet TC88 Series Torque Converters are Symmetric Systems. Comet 20 and 30 Series use 3/4" Top Width Belts. Comet TC88 and CAT99 use 5/8" Top Width Belts.